After the Civil War, many rural Southerners depended on tenant farming to survive. Tenant farming was a way for former plantation owners to maintain a cheap workforce following the emancipation of slaves. Though many whites refused to sell property to blacks, some would lease land to them for farming, with the landowner taking the majority of the profits. Others simply hired former slaves to work in their fields as low-paid employees. Both of these systems kept former slaves in a position of dependence, an added bonus for whites in the Reconstruction South. Cotton planter Eli Gregg was among the many South Carolinians who profited from this cartel. His father, John, had given him Gregg Plantation in Mars Bluff in 1836. Once slavery was abolished, Gregg worked with neighboring planters to bar black laborers from relocating without consent. This arrangement prevented African-American families from choosing where to live and work and also maintained a landowner’s control over his tenants. Laborers who left a farm were usually “blacklisted,” making it nearly impossible for them to find new work. Aside from the paltry wages paid to black workers – a 1929 payroll from the Gregg property shows one woman earning 60 cents a week for sunrise-to-sunset field labor – tenant farmers on the Gregg estate enjoyed few of the freedoms afforded by Emancipation. Eli Gregg used former slave cabins to house employees after the war. His son Walter acquired the property and built this tenant house around 1890. Walter Gregg’s son-in-law, Wilds Wallace, became the owner of Gregg Plantation around 1920, and he added a bedroom and front porch to the house for Otis Waiters, one of his most prolific workers. As late as 1967 another bedroom and a bathroom were added, as well as a back porch. Mattie Smalls Gregg, an African-American employee of the Gregg/Wallace family, lived in the house until her death in 1989. Her son moved out of the house 10 years later. The family’s belongings were left behind, and they are now preserved as artifacts depicting the lives of twentieth century African-American tenant farmers. Several of the former slave cabins from Gregg Plantation that were later used as tenant housing have been relocated from their original sites to the campus of Francis Marion University, part of which rests on former Gregg land. The Gregg-Wallace tenant house shown here remains in the same location where it was built; it is vacant and privately owned. The Gregg-Wallace Farm Tenant House, ca. 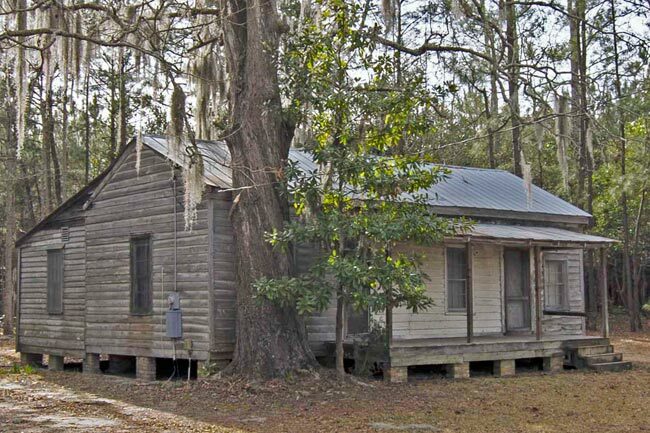 1890, is an example of the predominant form of housing for African Americans in the rural south for over a half-century after emancipation. White landowners exercised control over freed slaves after emancipation through the use of cartels that trapped African Americans in tenant houses and in wage labor. Landowners made secret agreements not to sell land to African Americans or allow them to move to another plantation without the consent of the previous owner. Thus African Americans were kept dependent on the landowners for their houses, their food, and their jobs. The cartel and the oppressive Jim Crow laws combined to enforce a system of intimidation that guaranteed the planters cheap labor and set strict boundaries on the behavior of the people who lived in tenant houses. The house’s construction is significant because it preserves tangible evidence of the evolution of a typical Mars Bluff vernacular tenant house. Tenant houses often evolved from one-room slave houses, first by the addition of a shed room at the rear and a front porch, then by the addition of a second room. This pattern was found throughout the south. My father Walter Gregg born 1934 in Florence sc and my grandfather also share the same name and lived in Florence sc til his death in a car accident back in 1960’s. Is this a piece of my family history. Great Article, have toured the cabins at Francis Marion.